Make the add-ons developed by Simtech Development GDPR-compliant. This is a must-have extension for CS-Cart that helps you comply with the GDPR, a European Union regulation on personal data processing. The GDPR is the European Union’s new data privacy law which impacts how all companies collect and handle personal data about their European customers. You need to make sure your site is compliant so we have developed the GDPR Compliance add-on, which makes add-ons developed by Simtech Development GDPR-compliant. Affiliate and Referral - the add-on stores the customer IP address when placing an order. Now you can anonymize this personal data using our GDPR add-on. Follow Vendor - now you can anonymize the list of the followed vendors from each customer. 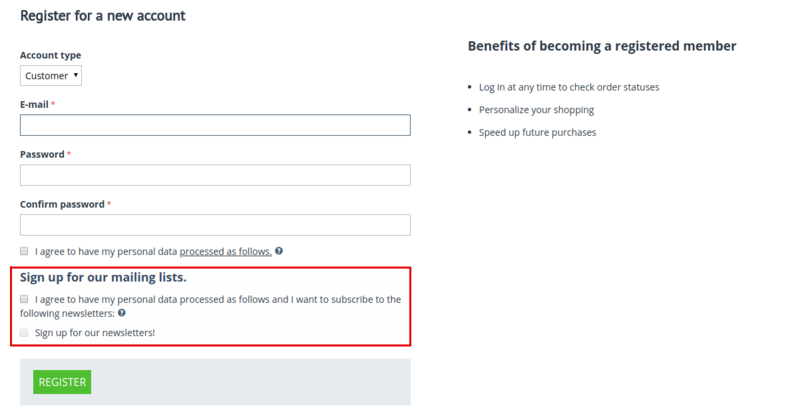 MailChimp Advanced - thanks to the GDPR add-on, you can anonymize customer personal data and such users will be deleted from the mailing list. The checkboxes have also been added to the places where personal data is collected (such as checkout, registration, and newsletter subscription forms). If you use the above mentioned add-ons in your store and your business must be GDPR-compliant, we strongly recommend installing our GDPR Compliance add-on. The list of adapted Simtech Development add-ons will be updated. NOTE: Make sure the default GDPR Compliance (EU) add-on is installed in your store. Otherwise our add-on will NOT work correctly. Install the Simtech Development: GDPR Compliance (EU) add-on on the add-ons list page (Add-ons > Manage add-ons). Click the + button in the top right corner, select an archive and click Upload & install. You can now find the installed add-on in the list of installed add-ons, just make sure it is set to Active. Now as an administrator you can manage customer personal data under the GDPR user data tab on the customer editing page. Here, you can also export personal data of a customer to an XML file upon request and anonymize a customer, replacing all his or her personal data with randomly-generated information upon request. [!] 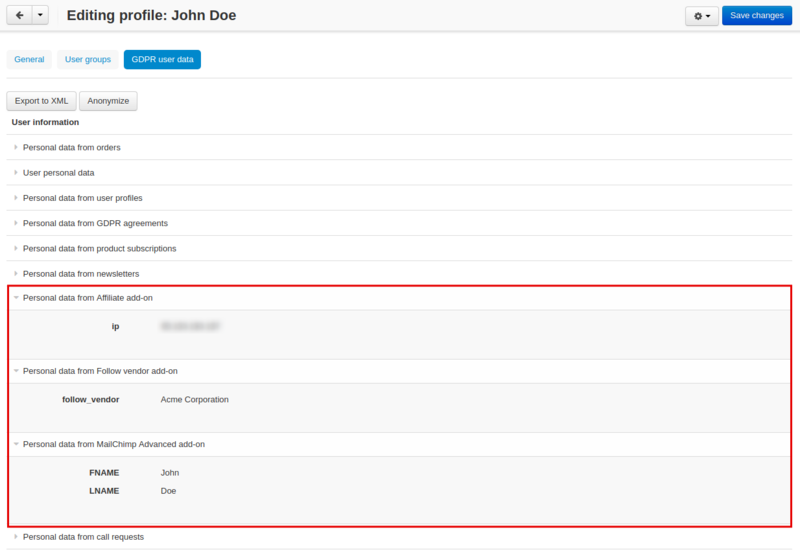 The GDPR tab did not show content with the customer information in the admin panel when the Affiliate and Referral add-on is enabled. Fixed. [!] The add-on was incompatible with store version 4.8.1. Fixed.